Beans are among the most versatile and commonly eaten foods throughout the world. These are the seeds from flowering plants and mainly classified as legumes. Usually all variety of beans grow in pods which are capsules with several beans inside. Some of the most popular bean varieties include kidney beans, garbanzo beans (chickpeas), lima beans, black beans, black-eyed peas, soybeans, red beans etc. Beans are a very good source of protein, vitamins and fiber. The amino acids present in the beans are the chemicals that combine to form protein. 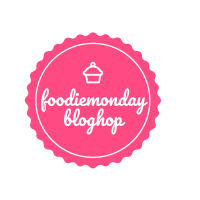 Well, the 164th theme of the Foodie Monday Blog Hop team has been decided as 'Beans Power'. That means we have to post a dish having bean as the main ingredient. So I have picked the chickpeas / garbanzo beans as the main ingredient and prepared a soup out of it as 'Roasted Chickpea Soup'. Chickpeas are actually the most oldest & widely consumed bean in the world. Chickpeas are also known as garbanzo beans or kabuli chana. Whether these beans appear in a creamy hummus or a hot soup or even a spicy Indian curry, the chickpeas don't help in weight gain as only loaded with protein, carbohydrates and fiber. So coming to the recipe, here I have used some roasted chickpeas, not the normal chickpeas. First some boiled chickpeas are roasted well in oven. And then those chickpeas are added to the soup which finally blended to get a smooth consistency in the soup. This thick soup is hearty enough to have as a main course along with a loaf of good bread. 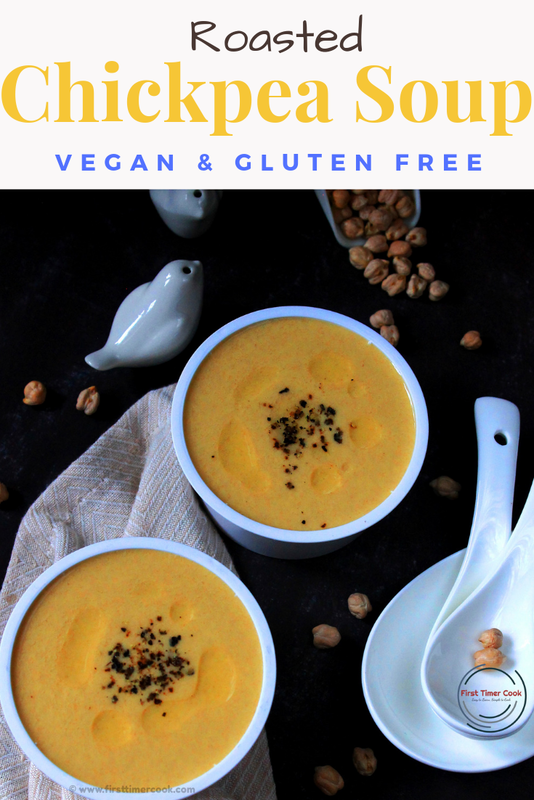 The soup is high in protein and completely gluten-free, vegan and even have a solid amount of protein and fiber. Pat dry all the boiled chickpeas using a paper towel until completely dry. In a mixing bowl toss all the boiled chickpeas with 1 tbsp olive oil, salt, 1/2 tsp red chili powder very well. Next transfer the chickpeas onto a baking tray and roast for 15 minutes in the preheated oven. Take the tray out of the oven, toss and again roast for 10 minutes or till the chickpeas looks crunchy and golden in color. Turn off the oven and keep aside the roasted chickpeas. Now heat 1 tbsp olive oil in a pan. Add chopped onion and saute for 2-3 minutes or until onion turns transparent. Next add minced garlic and saute for 1-2 minutes. Add tomato puree, remaining red chili powder, salt, cumin powder. Next add vegetable stock, roasted chickpeas and allow to boil first. Then over low-medium heat, cook for 8-10 minutes. Put everything in a blender jar and blend into a puree consistency. Taste and adjust the seasoning as desired. Then transfer the soup back into the pan and reheat to a boil. Finally ladle into the serving bowl, garnish with a drizzle of olive oil and a pinch of freshly crushed black pepper. Canned chickpeas (garbanzo beans) can be used here. But I have boiled chickpeas at home. Roasting the boiled chickpeas and using them in the soup sounds interesting Sasmita ! Can imagine how flavorful the soup must have tasted. Wonderful share ! Loved the recipe, especially using roasted chickpeas for the soup. 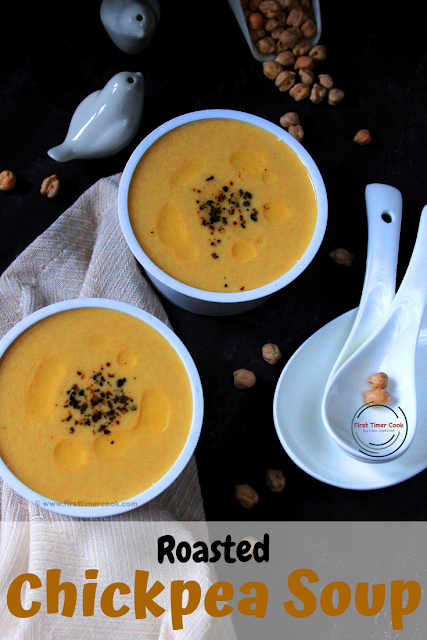 Hearty and healthy soup option and a must try for winter season fast approaching. Lovely recipe Sasmita, I do make chickpea soup but have never though of roasting them before using them for soup. That must be adding a wonderful taste to the soup. Love the recipe,photography and presentation! Whats not to like about this!.. 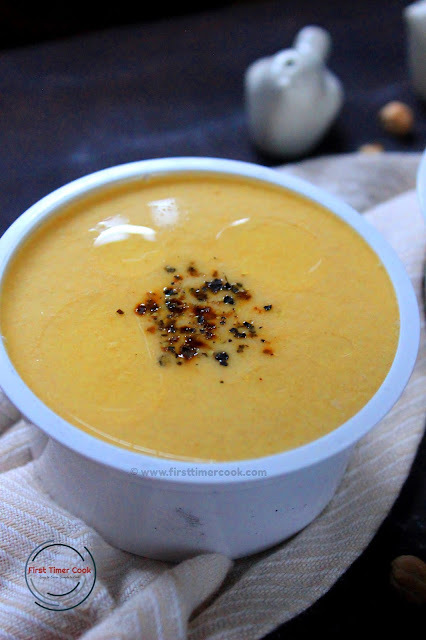 Never tried chickpea soup.. looks nice and filling. I will try it sometime soon. Soup looks so delish. The colour is so attractive too. This is best meal option when you want to have something light and healthy. 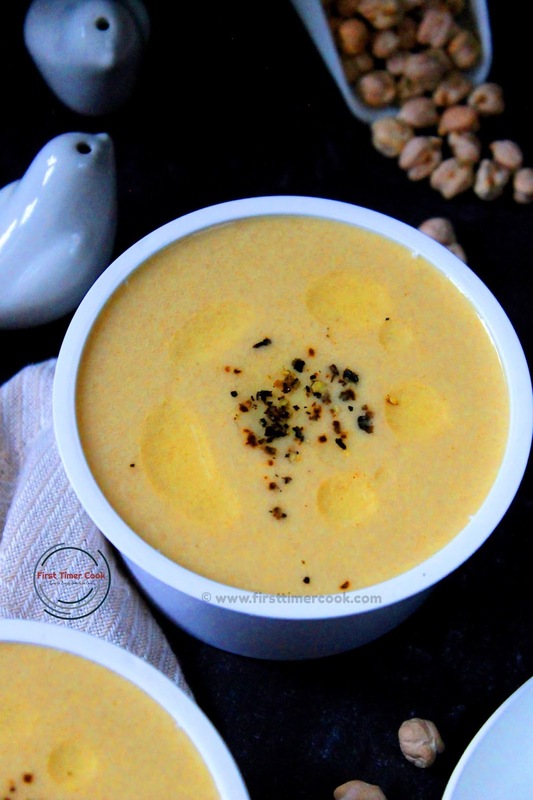 Roasted chickpea soup that sounds interesting Sasmita, Such a creamy and flavour full bowl of comforting soup. Wow! Amazing share. Hearty and healthy bowl of goodness. Soup with roasted chickpeas sounds interesting and aromatic. How colourful and creamy it looks!!!! It's an amazing soup recipe. Never tried roasted chickpea soup. Will surely try this sometime. Thanks for sharing !!! 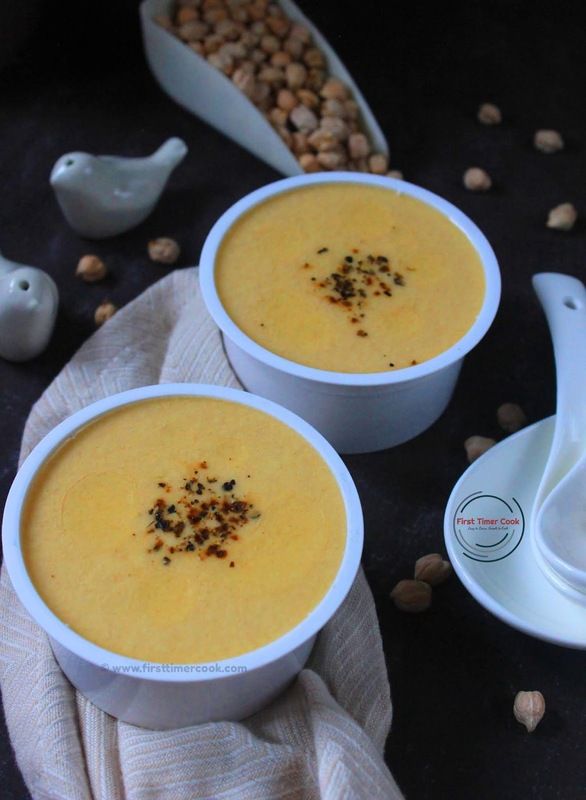 Soup with chickpeas is very interesting and innovative. It looks so delicious and creamy. Deliciously and comforting flavoured roasted chickpea soup, perfect for coming chilli days. bean soups are very healthy and nutritious not only in winters but any time during the dear. Great recipe for season. This looks so amazing, roasted bean is so healthy and the soup. I am surely trying this once we are back to the grey sky. A comfort food for me, loved this one. The roasted chick pea must have given a nice taste to the soup. Roasting brings out great flavors , I believe this rich and creamy soup is bursting with warm and cozy flavors ! Perfect for the chill weather that is about to come!! Healthy and hearty soup!! The season of soup has started. Love the colour of the soup and indeed roasting chickpeas is going to enhance the dish. Lovely share. Roasting the chickpeas and then making them into soup seems a brilliant idea as the roasting will bring out the flavours of the chickpeas. Lovely share for this theme, Sasmita!